Voted best in sales and service in the greater Bangor area for the last 18 years! Computer Essentials is a family owned and operated local business that pride's itself on taking care of it's customers. From choosing a computer to using a computer we can help and we service what we sell, ourselves....in store! "Computer Essentials carries the highest quality machines in the Bangor area and I'm repeatedly impressed how knowledgeable and helpful their technicians are." Originally Computer Renaissance opened for business in 1996. 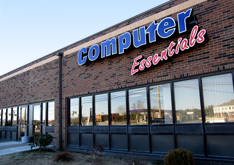 The current ownership took over in 2000 and then we changed our name to Computer Essentials in the Summer of 2006. We quickly grew to expand our staff, services and inventory. Now we have have 6 full-time technicians with at least 2 always in both stores ready and willing to help. In March, 2009 we opened our second store on 225 High Street in Ellsworth, Maine. The new building had 2400 square feet and had 4 dedicated tech benches. In March, 2010 we moved our store upstairs, replacing the old Curtain Shop. Our new location features 4000 square feet and a full size tech center with 6 dedicated benches. Our expanded sales floor allows us to provide a wider selection of computers, accessories and equipment for our customers. In March, 2015 we moved our Ellsworth store to 41 High Street. Our new location features 3500 square feet and a full size tech center with 5 dedicated benches. Our expanded tech department allows us to provide quicker turn around time so less downtime for our customers. A Maine native, after traveling and working in different areas around the country Bunker returned to Maine to start a business and raise a family. Though formally educated in Electrical Engineering, Bunker started to develop a real interest in computers when they become mainstream in the mid 80s. He quickly taught himself everything he could about maintaining and building computers and soon met other people who shared his passion. He opened Computer Essentials after he saw a real need for knowledgeable, local computer experts. A Maine native and part owner, Dave has had a life long interest in electronics starting when he was a kid playing with his dad's short wave radios. He grew up in Milford and then moved to Old Town to raise a family. Also self-taught, he ran L&D (Leo & Dave) computers from 1997 to 2000, a local computer repair shop, until he joined Bunker to open Computer Essentials. Bunker's wife and part owner. Born in the south, transplanted to Maine in 1981 and is a big help in the behind the scenes operation of the store. Her cheerful disposition is enjoyed by the customers and the staff along with the many food goodies she loves to share as she is an excellent cook. A Maine native, Dave's wife, Bunker and Linda's daughter, is responsible for insuring the daily office routines are taken care of like "the books". Friendly and knowledgeable, Trisha often helps on the sales floor when needed and is a big asset to the company. Mike started off as a Tech and worked his way up to Manager of the Ellsworth store. Mike has accepted the new role and we are sure he will do an excellent job of overseeing the Ellsworth operation and insuring the staff there have what they need to take care of our valued customers. The Ellsworth location has been open for over 9 years now and still going strong. Jon has cheerful disposition and a willingness to help determine the right choices for your computer needs makes Jon a good fit for our sales team. Shelby joined our sales team with a working knowledge of computers and a cheerful disposition. Very eager to always help the customer get what they need. Originally from Old Town, David is one of our Onsite Technicians and the Tech Manager. Self taught and very thorough. He specializes in network, and business setups. He pays special attention to providing a great customer experience. An Old Town native, Justin serves as a Technician at the Bangor Computer Essentials location. He has been building, troubleshooting, and repairing PC's and mac systems for over 20 years. He extends every effort for timely, effective service and careful attention to detail. A valuable addition to our team. Joel is our "come back" Tech and very eager to always help the customer get what they need. Having returned to work for us with a great working knowledge of computers, he has excellent troubleshooting abilities and is a great team player which makes him a perfect addition to our team. We are open 6 days a week in Bangor! Copyright © 2015 Computer Essentials. All Rights Reserved.